McGlinchey was holed up in a safehouse in Newmarket-on-Fergus - aerial view here. Further aerial view of the residence where Dominic McGlinchey was captured. An aerial view of Lyon's residence at Ryan's Cross, where McGlinchey, then head of the extreme group the Irish National Liberation Army, was captured. A view of the front of the house, where Dominic McGlinchey was arrested 30 years ago. A side view of the house, where a shoot out took place between McGlinchey and the gardai in March 1984. A view of the rear of the house, with three cars parked in the yard. A shed at the rear of the house where McGlinchey was captured after 18 months on the run in 1984. The upper floor window of the house shows bullet holes sustained in the shoot out. The skylight on the flat roof extension shows bullet holes. The dormer room from where McGlinchey's gang fired out at Gardai. Close up on the fire arms at the scene and a discarded balaclava. A bed at the scene of the shooting, with a spent cartridge case on the pillow. Rifle bullets at the scene of the shooting. A lifted mattress showing an AIB lodgement bank bag, a Joan Armatrading record. A close up of a hold-all bag seized at the scene containing cash, and a game of Downfall. A mattress lifted displays hidden multiple pound notes, and a game of Monopoly. 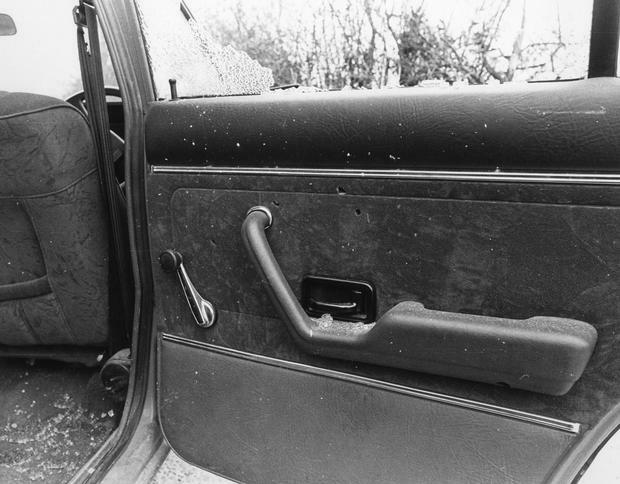 Photo shows damage to the garda car after it was shot at by the McGlinchey gang. Firearms recovered from the house following the shoot-out. A view of the neighbouring McEnerney home showing a damaged wall and pillar. McGlinchey was to surrender eventually after a priest arrived. THESE are the pictures from one of the most amazing gun battles in the Republic in recent decades. They show the bullet ridden garda cars and windows from the gun fight between then INLA leader Dominic McGlinchey and the heavily armed garda task force from Special Branch sent to capture him. The events occurred 30 years ago this week. 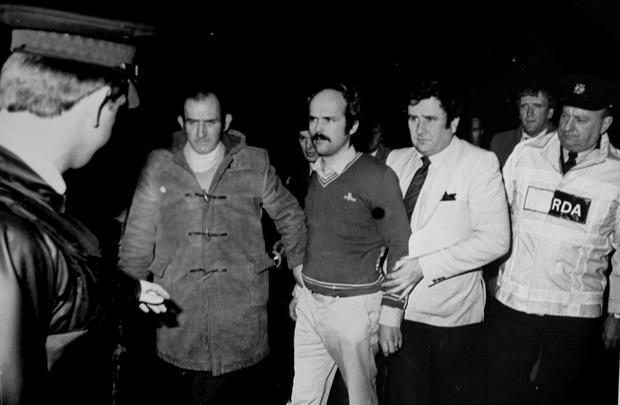 Dominic 'Mad Dog' McGlinchey who claimed to have killed 31 people, including a child, was caught in the dramatic operation by the garda's Security Task Force, which was the unit from which the current Emergency Response Unit was moulded. St Patrick's Day marked the 30th anniversary of the capture of Ireland's then most notorious republican killer, Dominic McGlinchey, after the blazing gun battle with garda detectives in Co Clare. McGlinchey was holed up in a safehouse in Newmarket-on-Fergus after a massive manhunt when the small party of armed detectives arrived. He was wanted for the murder of a 77-year-old woman, Hester Mullan, in March in south Derry after his fingerprint was found on the roof of the car used by her killers. After an extradition warrant was issued in Belfast for his arrest, McGlinchey, then head of the extreme group the Irish National Liberation Army, went on the run in the Republic for 18 months. He and his gang were rampaging around the country, pursued by gardai. They were heavily armed with automatic assault rifles, a pump-action shotgun and handguns. McGlinchey's wife, Mary, was with him while their three children were being cared for by supporters. On two occasions his car was stopped at garda checkpoints and on both occasions they overwhelmed gardai with their firepower. At Cobh, McGlinchey had to restrain his wife after she threatened to murder two gardai. The gang robbed a bank in Foynes and in another confrontation disarmed a garda of his Uzi machine gun. They made the gardai strip off their uniforms at gunpoint. His supporters in the North wrote a ballad about his treatment of the unarmed gardai: "Hands up, trousers down." The humiliation of their unarmed colleagues made Special Branch detectives even more determined to track down the multiple killer. After weeks of work they pinpointed the house in Newmarket. 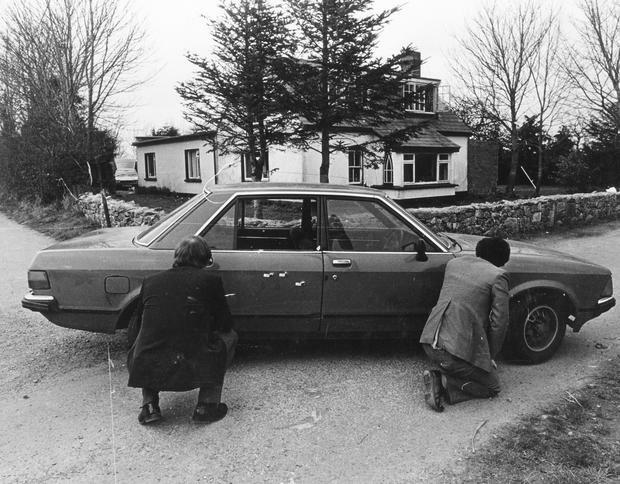 As teams of crack Security Task Force (STF) detectives approached the house McGlinchey opened fire from an upstairs window on the Ford Granada containing Det Sgt Dermot Jennings, who retired as an assistant commissioner recently and elite Detective Gardai Chris Power and Sean Lee. A gun battle then ensued as firing continued from inside the house. In the exchange Det Garda Power was hit in the shoulder. The STF forced their way into the house and McGlinchey then shouted out for a priest to be brought. He surrendered after the priest arrived. Det Garda Power bleeding heavily, was only then safe to leave the scene for treatment. In the fastest extradition in the history of the State, McGlinchey was rushed to Dublin before the President of the High Court, Thomas O'Higgins, and taken across the border that same night. He was convicted of the murder but acquitted on appeal. He was then re- extradited back to Dublin where he received a 12-year sentence for the Newmarket-on-Fergus shoot-out. McGlinchey came from the south Derry village of Bellaghy, also the home of Nobel laureate Seamus Heaney. McGlinchey was steeped in Republican folklore and joined the IRA at 17. He was interned without trial for 10 months and within months of his release in 1973 he was re-arrested after being found in possession of a gun. He was released in 1976 and went on a murderous rampage with other members of the "South Derry Brigade". His gang included Francis Hughes and Thomas McElwee, both of whom went on to die in the 1981 Maze Prison hunger strike. Between 1976-78 the IRA gang murdered 19 people in the south Derry area, including a girl (10), Lesley Gordon and her father, William as well as Hester Mullan. The memories of McGlinchey's rampage were rekindled by the brutal murder of two British army engineers at Masereene Barracks in Antrim five years ago. The attack was a carbon copy of McGlinchey's and Hughes' gun attacks on police stations in the same area. The South Derry IRA gang was so lethal the British government posted the Special Air Service to help in the hunt for them. They tracked them as they tried a cross-country hike over the Sperrin Mountains and Hughes was shot and injured after he managed to kill one of the SAS soldiers. McGlinchey escaped and went on the run in the Republic where he was arrested in 1977 after holding two unarmed gardai prisoner and stripping them of their uniforms in Co Leitrim. While in Portloaise jail he fell out with the IRA leadership and joined the extreme INLA. McGlinchey and his wife, Mary, both travelled north from their council estate home in Muirhevnamor in Dundalk to carry out attacks in the North. But the Bonnie and Clyde, gun-toting couple also became heavily involved in smuggling and extortion in the border area. McGlinchey was insanely jealous and believed Mary had an affair while he was in Portlaoise Prison. In May 1983 he tortured and murdered fellow INLA man, Eric Dale, from Armagh believing he had slept with his wife. Two months later McGlinchey and Mary together murdered two other south Armagh men, Patrick Mackin and Eamon McMahon, a brother-in-law of Eric Dale. As tensions mounted within the INLA, McGlinchey and Mary struck again, this time with the brutal murder of Gerard "Sparky" Barkley, 27, from Belfast. The couple lured Barkley to their home where McGlinchey shot him through the back of the head as he sat watching television. They dragged him to the back yard, slit his throat and drained his body of blood to make it lighter to carry to his car and dump it near the border in a secret grave. On another occasion when Mary was present McGlinchey and his henchmen tortured an INLA man for hours, roasting him on an Aga cooker. While McGlinchey was in prison in January 1987 gunmen burst into the family home and murdered Mary as she was bathing her children. They shot her nine times in the head, the bullets marking the form of a cross. McGlinchey was released in 1993. A broken man, he still tried to fall in with criminals in Dublin and the border area. But they betrayed him to his former INLA enemies and they shot him dead in Drogheda the following year.